When on the opening night of your own festival, you’ve just played a two-and-half hour all covers set that has literally blown up on the internet, what do you do for an encore. When its Wilco, arguably America’s greatest band, you play an equally long show with deep cuts, with a judicious sampling of early material, with guests, with prize winners and with hilarious banter. Wilco followed up their show of the year with a “standard” show that rivaled in quality the memorable night before. Of the light moments, perhaps the best combination of humor and topicality was the band’s dedication of Wilco’s ode to alcoholism “Passenger Side” to the festival’s “bad boys” Foxygen, who were also the subject of multiple Tweedy barbs throughout the set. We’re streaming that track below. 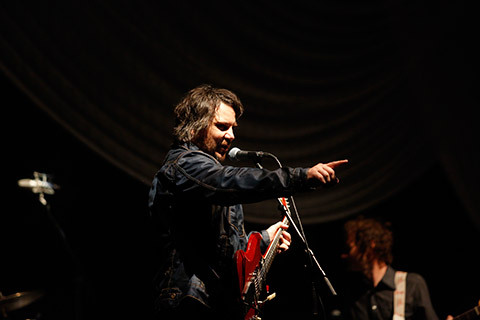 Wilco is currently on the AmericanaRama tour which comes to the NYC area for a show on the Hoboken Waterfront on July 26. After we left North Adams on the crazy roadtrip of Friday night, we were fortunate to still have friend of the site gr8fulpete to record and offer his Saturday night files to us. Pete’s recently upgraded rig performed excellently on this windy night and the result is a superb recording. Enjoy! If you download this recording, we expect that you will PLEASE SUPPORT Wilco, visit their website, and purchase their official releases at their website [HERE]. nyctaper – thanks so much for your site, recordings and sharing the taping love across the interwebs. I’ve been enjoying the all covers show since you posted and now I can’t wait to fire this one up. thanks again! cool, thanks for this…. I was ready to just enjoy my last night of the fest and so didn’t record this, figured it’d be well-covered…. and in wandering around at the rear of the crowd, I actually ran into Steve Wynn taking it all in himself and got a have a nice little chat with him about his upcoming plans and projects…..